The UN intersessional negotiations on climate change (UNFCCC), which started in Bonn last week, enter their second week with the big questions: how to find and allocate by 2020 the $100bn as agreed in the Paris Agreement. The first week of the negotiations started slowly, and ended even slower. Negotiators look like they still have some sort of bad hangover, thanks to the fact they are still celebrating the Paris agreement. And while discussions take place inside the UN building in Bonn, Sri Lanka tries to recover from the worst floods in its history, India reports the hottest day every recorded in the countryand Carbon Brief warn that we only have five years until the 1,5°C carbon budget is blown. As the international community prepares for November’s COP22 in Morocco, this is the first round of technical discussions following COP21 in December, which resulted in an historic agreement signed by almost 200 nations. And as the dust settles after the victory of the Paris Agreement, the burning questions now concern its implementation. The negotiations started last week with a plenary welcomed by COP president Ségolène Royal, who replaced Laurent Fabius. Christiana Figueres, outgoing UNFCCC Executive Secretary, reminded everyone to put human rights at the centre of development. While the incoming COP22 president Salaheddine Mezouar said that the upcoming COP in Marrakech will be one of actions, emphasising the importance of preparing ‘the roadmap’ to mobilise $100bn by the year 2020. On Wednesday, the UN Secretary General, Ban Ki-Moon officially announced the appointment of Patricia Espinosa of Mexico to the UNFCCC Executive Secretary. The major political issues now being discussed in Bonn concern financing, and how to find and allocate the $100bn (by 2020), which was agreed in Paris. Unsurprisingly, this has been the key concern, especially for developing countries that are mostly affected by climate change. Adaptation is, of course, another issue for frontline nations whose argument is that these talks cannot focus solely on mitigation, especially when so many countries are already feeling the impacts of climate change. There is also a sense that countries must now realistically review their pledges and adopt much more ambitious commitments to get to the 1.5 degrees. Most importantly, perhaps, is the creation of APA – a new Ad-Hoc Working Group which will define the modalities of implementing the Paris Agreement, working together with the Subsidiary Bodies for Implementation and Scientific and Technological Advice. 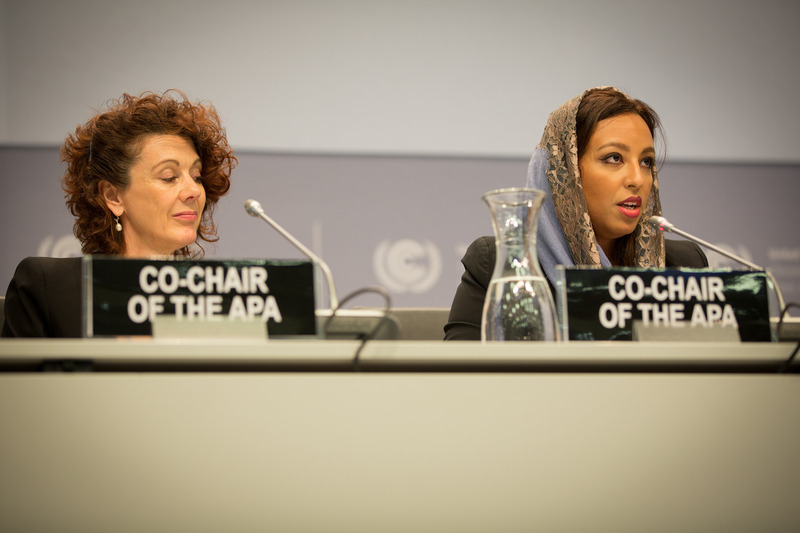 Sarah Baashan from Saudi Arabia and New Zealand’s Jo Tyndall are the two newly nominated female co-chairs for APA. Defining the agenda of this new group proved difficult in the course of the first week. The G77 and China proposed amendments, trying to ensure that it will not only focus on mitigation measures. What they want is a focus on other elements such as adaptations, loss and damage, finance, technology transfer and capacity building. Because of this, the APA negotiations were suspended until an agenda was agreed on Friday. Outside the negotiations, France has ratified the Paris Agreement. Developing countries Ecuador, Guatemala and Bolivia, have called for rules on the participation of observers in COP22, as some have “commercial interests”. The move was supported by civil society organisations such as Corporate Accountability International, which highlighted the big presence of the fossil fuel industry during climate negotiations in Paris. As we enter into the second week of the technical talks, everything indicates that the world’s governments have a long way to go, and in truth, must return to the negotiation table. With more and more citizens around the world pressing for immediate action, it remains to be seen whether our representatives can and will intensify efforts to achieve the goal of a cleaner, more sustainable future.